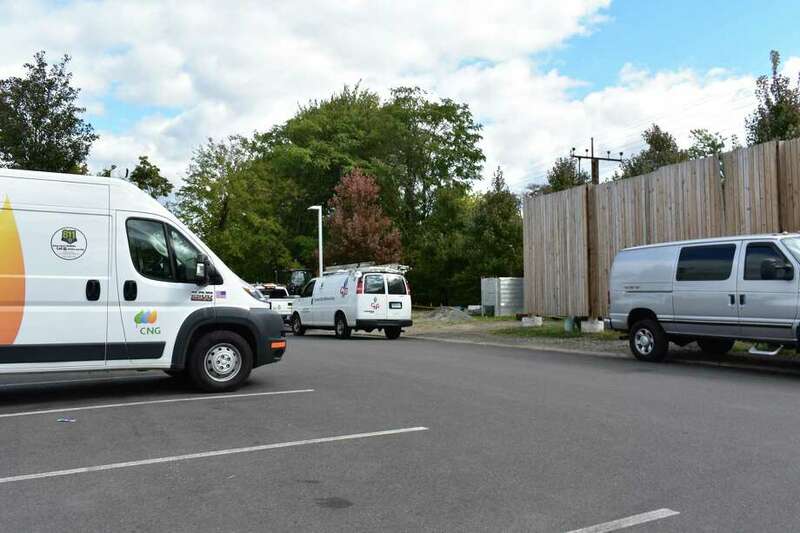 Service vehicles for Avangrid subsidiary Connecticut Natural Gas, in October 2018 in Greenwich, Conn. With oil prices down, home conversions to natural gas have slowed, with prices having spiked last winter during a cold snap. Regional home heating providers say they are seeing an increase of customers opting to lock in fixed prices before heating costs start their traditional winter increase. “At the moment, no one expects oil prices to really spike up this winter, but just the same, a lot of people are taking advantage and saying it’s not a bad time to lock in to fixed rates,” said David Cohen, executive vice president at Standard Oil, which serves the region. Southwestern Connecticut is home to just over 100 home heating oil dealers of more than 550 dealers statewide with active licenses on file with the state Department of Consumer Protection; another 40 dealers are in neighboring states with territories extending into Connecticut. Despite Cohen’s optimism, the U.S. Energy Information Administration projects that home heating oil costs will rise as it does most winters. According to EIA data, heating oil prices could increase to $3.17 per gallon, up from $2.78 last winter. Natural gas, however, may see a slight decline from last year: EIA data shows a 2.6 percent decrease in cost per unit from 2017. A drop in oil prices will have an impact on the pace of households converting to natural gas, spokesmen with Eversource Energy and Avangrid told Hearst Connecticut Media last summer. Still, the gap between fuel oil and natural gas has been narrowing. As of 2016, 45 percent of Connecticut homeowners used fuel oil to heat their homes, according to the EIA, with 35 percent relying on natural gas. The state Department of Energy and Environmental Protection regards natural gas as a key piece of Connecticut’s energy policy, with a major pipeline entering the state in Danbury undergoing an expansion to tap supplies from the Marcellus Shale regions in western New York and Pennsylvania. But natural gas prices are also prone to spike during cold snaps, including last winter, because natural gas-fired electricity plants need fuel to run turbines to keep up with demand for households and commercial facilities relying on electric heating systems. Even with lower prices early in the heating season, providers encourage their customers to begin to conserve heating fuel as soon as the weather begins to chill. “You can control how much oil you use, you can’t control the price of oil,” said Peter Russell, president of Santa Fuel. The Bridgeport-based company serves roughly 9,000 households in Fairfield County and western New Haven County. Regular maintenance and cleaning of heating systems remains important for homeowners looking to save money this winter. For customers looking to save even more, Russell recommends customers invest in programmable thermostats and energy audits — which Santa offers. For Standard Oil, customers have made the pricey energy kinetic boilers one of the company’s top selling boiler systems, Cohen said. Cohen said they can save up to 25 percent on fuel. “People are making that investment these days because the payback is there,” he said. The company also keeps tabs on temperature fluctuation and individual household consumption trends. Most of Standard Oil’s customers are on automatic delivery, which has made it easier to serve customers amid the uncertainty of the winter months, Cohen said. There are about 500,000 households in Connecticut that struggle with their home energy costs, according to nonprofit Operation Fuel, which provides energy assistance throughout the state. “The problem continues to worsen as the cost of basic needs (and) energy goes up and wages remain stagnant,” said Brenda Watson, executive director of Operation Fuel. Operation Fuel’s winter energy assistance program last year served more than 7,000 households, supported by $3.1 million in grants. But this winter, with an annual budget of $2.5 million, Operation Fuel will likely only be able to help a maximum of 6,000 households, she said.